The wine is reminiscent of a northern Rhone wine that is fermented with 2% Viognier, which lifts the aromas of pepper, spice and dark fruit. This full-bodied wine finishes with fine tannins and structured spicy fruit. It should be aged for 3 to 8 years. The wine produced on this property reflects the essence of the land, and supports our belief that great wine is grown in the vineyard. Organic viticulture aims to sustain and enhance the fertility and life- supporting ability of the soil by not using chemical fertilizers and sprays. The health of the land for the long range production of quality wine and olive oil is the goal of our organic process. The nose is filled with blackberry and blackcurrant fruits, licorice and vanillin. Medium-bodied with a solid texture of dark fruit, roasted coffee, and spice flavors. Long finish. Traditional vinification in small tanks. Four week maceration. Aging in 2-3 year old oak barrels for 16 months. No fining, no filtration. great with "Entrecote a la Bordelaise" which is Beef Steak marinated in red wine with Shallots. Kennedy Point Sauvignon Blanc is made from 100 percent Sauvignon Blanc. 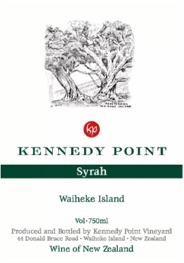 Kennedy Point Vineyard makes a Marlborough Sauvignon Blanc that captures the essence of the regional fruit. The grapes, grown in the hot, stony soils of the Wairau, produce a wine redolent of fresh cut wild flowers and a full palate of passion fruit, gooseberry and citrus. The wine has a crisp dry finish and is perfect as an aperitif, with seafood or any light summer meal.